An initial bouquet of the dried yellow fruit found in muesli; later on, added scents of unsweetened coconut, honey, and light toffee beautifully complement the dried fruit aroma. The palate entry is chewy and honeyed; at midpalate the dried fruit, clover, and honey flavors meld delightfully with the oily, creamy texture. Concludes sensuously and regally. 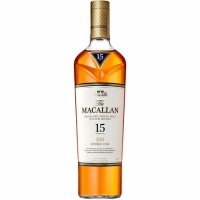 Best Buy. .
Reborn as The Macallan Triple Cask Matured 15 Years Old from April 2018, The Macallan Fine Oak 15 Years Old is embodied in a new look range; offering the same extraordinarily smooth, delicate yet complex character with a new name, new bottle and bold new packaging. Reflecting the quality of our whiskies and unveiling the skills and craft of the Macallan Masters, this new identity for our core range will roll out from the end of April across the world.